In the middle of the ocean on a bright and calm day there lay a well-manned ship and well was it for them, for they were in the heart of the ocean and a place frequented by pirates. Though it appeared a dead calm the small craft moved quickly under the influence of the sail which caught the higher wind. "Sail Ho!" yelled the lookout, a sturdy man armed to the teeth. Soon the lately peaceful deck became a bustle but by the time they were near to the large ship there was not a man without a weapon. Then the large ship, obviously doubting the small vessel's intentions, turned and began a retreat. In an instant a red flag with the black bat emblem (see picture to clarify) was waving from the mast peak and the little ship followed in hot pursuit. Soon it became evident that the pirate, for such there was now no doubt that it was, ship's speed was superior to that of the larger vessel and it would soon be over taken. The larger ship seeing that all was lost stopped and determining to ram the smaller craft went straight toward it. The smaller ship veered just in time and using hooks boarded the other. A fierce but brief conflict followed in which the pirate crew gained the upper hand. The man who appeared to be the captain of the pirate vessel then ordered all the goods to be placed in his ship and the other burned, leaving the prisoners in a small boat to their fate. "Who is that?" asked a man wearing a blue and black suit of armor to a small man, who evidently was a merchant. "That is a relatively rich merchant that visits here now and then," replied the small man. "See, there lies his ship, but he seldom visits long." "Thank you," said the other and he walked toward the ship the merchant had pointed out. Asking one of the crew what the captain's name was he received a touch on his shoulder. "Beg your pardon," said the captain "But do you intend to buy something?" "No," he replied. "But may I ask your name and business here?" "My name is Jean, and my business to sell my goods," answered the captain. "What do you sell?" inquired the man with the suit of armor. "I thought you did not wish to buy." "True, but that means nothing and I could advertise them." "Perhaps, but beg your pardon, I must go and cannot talk with you forever, maybe you can talk with my mate," and pointing to the mate he quickly left. Three hours later a band of armed men marched down the dock toward the small ship. The captain went to meet them evidently surprised. "What is this?" he queried. "Pirate," returned the leader, some noble of high rank, "We are here to arrest you and confiscate your ship." One of the crew started and began, "How did…" A stern glance from the captain silenced him and he replied, "How dare you to accuse me of this thing. What proof have you? But please wait though, my man was saying?" "How did you so quickly return?" continued the sailor, looking at the man who had been there before, after spotting him in the band. "We have proof in your man right there," said the leader paying no heed to the sailor and nodding toward one of the crew. Then he continued sarcastically, "But we will pay you a good sum if we find ourselves incorrect after you spend some days in prison." With that the captain was infuriated. "We'll teach you a lesson," he exclaimed and with that one of the crew threw him an admiral hat with golden skull and cross bones and the red flag was run up the mast. But the pirates soon began to lose and they were all lead away in chains. The pirate captain, because he was on the dock, managed, after fighting bravely, to escape in a small boat planning to revenge himself on the powerful lord. Meantime of course the rest of the world was moving on. The new queen's coronation/banquet was going to be soon so Navarre decided his revenge could wait! Such an opportunity could not be put to waste! Also the outlaws were holding a barfight so William Navarre sent his brother Joshua, an accomplished assassin working for Navarre. During the period before the coronation/banquet of the queen, Navarre was doing his best to harass the powerful lord named John de Guarmal of Garheim. Every time he got information that John was out of his castle he was on the attack. Sometimes it was a fight on a hilltop but most of the time the odds were against the noble. One time they were ambushed and totally defeated by Navarre on the edge of a cliff because the outlaws tossed down boulders on them, crushing them or knocking them off the cliff (see picture above). Splash, tramp, slush, a lone outlaw walked along in the swamp. "Aha," he exclaimed and climbed up a perpendicular cliff rising in every direction out of the bog with carved steps and an old bridge crossing over to the edge of a cliff. Suddenly a shout went up and about five Garheim solders, who evidently were under the command of John de Guarmal, rushed toward the outlaw from every side. The outlaw fought skillfully and also the position favored him. He killed two then the bridge gave way and a soldier plunged into the swamp. Another began carefully to cross the bridge and the outlaw cut it and though he scrambled back up he ran away with the other and fled like a coward. So the outlaw continued his way in peace… Three days later… "Yes on the day of the queen's banquet." Suddenly the door burst open and the same outlaw that had so skillfully defeated many Garheim soldiers walked into the room. "Ah, Areneas what do you have? A letter, I perceive," remarked William Navarre, who had been the one talking before. Areneas the outlaw gave him the letter. As Navarre read the letter he made it obvious that he was displeased. "The Garheims are on the way to besiege us here. Ha! Well we'll be ready for them!" A man in a dark cloak suddenly moved into the light and whispered into Navarre's ear. William made a motion dismissing Areneas who quickly went to the upper room. But Areneas was curious, why was Navarre conversing with an assassin? He decided eavesdropping might prove profitable to himself. Muffled voices rose through the floor "No, we won't change it, it must take place at the…" William's voice trailed off so Areneas did not catch the next few words until the voice of Navarre said "At the banquet!" "Yes, I'll be ready," replied the assassin who, unknown to Areneas, was Joshua, William's brother, who had recovered from the barfight. Footsteps could be heard on the stairs and Areneas silently ran to the uppermost story intent upon his newfound secret and filled with questions. Who was the plot formulated against? "I'm telling you speed is of no use, they were forewarned!" I exclaimed (I am John de Guarmal's Second-in-Command). "We must continue at all speed!" replied John de Guarmal. "As you say general. I suppose we may be there in time so that they aren't totally prepared," I sighed. "I think," the disagreeable Lenfel lord who was accompanying the army of John spoke up, "that Smith is correct, but as you are paying me to obey you and not to defeat the outlaws, it is none of my business!" and he got up and left the others soon to be conversing with the men in the camp. "Good riddance!" taunted John de Guarmal. Turning to the other generals, he expostulated, "We should be there in less than five hours! "…Five hours later…"Traveling in the swamp seems to take longer than you expected," grumbled one of the generals as another halt was called because the supply wagons got stuck. "We will pause here for the night," responded John. Camp was soon set up and after a quick supper all the men, except the guards, were asleep. Areneas hurried down the stairs and quickly informed Navarre that the enemies were in sight. "Good, we have the advantage since half of our men are out to ambush them!" Soon the enemy was near and the outlaws set up a yell and rushed toward them from three sides! The enemy quickly retreated for a moment and Navarre's troops advanced at a run. John de Guarmal's soldiers, however, were well-trained and went toward the outlaws in a solid body forcing them to retreat into the tower of Aldermore. There Navarre waited, making occasional raids and killing some of the soldiers who had carelessly thrown off their armor because they were too hot. Outside the Garheim/ Lenfel junction attempted to reach the top of Aldermore by climbing ladders, which turned out to be a disaster since the outlaws just threw over the ladder. In addition, they were building a siege tower and with it did considerable damage to the wall. On one of their raids, however, the outlaws burned the siege tower to the ground and during the confusion tactically killed many of the Lenfels, purposely aiming at the men only paid to do the job. Furious at this the Lenfels again tried the ladders, which failed again. This made them so mad that they deserted that night, led by the disagreeable Lenfel lord who was very easily upset (unlike most Lenfels), taking as much of John de Guarmal's supplies as they could. The siege was then abandoned by the enraged Garheims, who met the men led by the Lenfel lord at the Benteel Bridge and totally destroyed them, taking back their supplies. By now the soldiers of Guarmal were not going to go back to the tower of Aldermore and instead went back to their castle very disheartened. See The Coronation for what happened between these two stories. Joshua Navarre was shocked at the turn of events. William had gone to the banquet in disguise and gotten captured which disrupted their plans entirely. Well, Joshua was not going to let his brother be a captive but how was he supposed to help him out of an island fortress when in all likelihood he would not be able to even get to the island unseen? As he wandered through the swamp he thought about the ways Navarre could escape. At the other side of the swamp someone else was in meditation too and soon the two saw each other. "Why, Gavin of Lockwood, what are you doing? Have you heard the news?" asked Joshua. "Oh yes," Gavin replied. "Astonishing news! Who would have thought that the queen was evil? But perhaps you can give me more information?" "Yes, everyone attending the banquet is a prisoner and action against the new queen will result in their torture!" "Yes, and Navarre as well, so perhaps we could devise a plan to help him escape?" "Ah! That is a difficulty!" answered Joshua. "They are kept in the castle on the kings isle which nearly impregnable against attack and I think escape will prove to be very difficult!" They talked on for some time until they reached the edge of the swamp where they separated planning to gather information and think of ways to help Navarre escape and then meet nearer to the king's isle. Once Joshua Navarre reunited with Gavin he had hit upon a plan. On a dark night they went out silently in a boat and once near the king's isle slid into the water, leaving a companion to bring the boat to the isle in three nights. Swimming underwater a ways they found the sewer system and swam into the castle. When they reached a grate they lifted it and climbed out into the courtyard. Then they hid until a guard came by and Joshua disposed of him, placing the guard in a convenient spot where no one would notice. Then they set about trying to find where William Navarre was kept. William Navarre, due to the fact that some rascally Loresii convinced him to take a drink of wine (that stuff is addictive), soon got too drunk to fight back the queen's men or to remember all his hidden weapons. By the time he was again sober the queen's men had taken any weapons he had brought and he was in a dungeon all by himself, which had only one small barred window. Next day in the morning he received a chunk of black moldy bread and some water from the jailer. Thoughts swirled in his head, but each idea of how to escape was more impossible than the other. He threw himself on the cot. If only he hadn't come! Then he began to blame those Loresii that had him take some wine but at second thought he decided he didn't want to be the next Roawian martyr. He soon fell asleep thinking of a feasible way to escape. After he had been asleep for some time he suddenly awoke. What had awakened him? The only noise was the scurry of mice. Then muffled thuds came from outside. He got up and went near the door, which someone open. "Joshua!" "Wait," Joshua replied, "come with me." They ran silently down the passageway followed by Gavin. "What is your plan?" inquired Navarre of his brother. "There is a boat waiting outside the gate, but hush! Now comes the most dangerous part." "What's that?" "Passing the guard in charge of the alarm bell!" Joshua walked silently into the court, the guard saw him and reached for the bell just as Gavin's knife flew at him reaching him before he could ring the bell. Suddenly the jailer burst into the court having discovered Navarre's absence and he raced up the stairs narrowly missing another of Gavin's daggers. Bong, bang, bong! The guards came rushing into the court and though they fought bravely soon Navarre, his brother, and Gavin of Lockwood were locked in the dungeon. Torture, a dreadful word. The wheel, the boot, the drop, all torture is horrible and painful. Yet sometimes one can undergo it and at other times one must. William Navarre and his brother were to soon come acquainted with torture. However, despite wishing very much to discourage them from escape, Maldrake, the new queen's adviser, did not wish to kill them, therefore the wheel or gibbet would not be their fare. Instead, William, as well as Gavin of Lockwood, would have to undergo the drop while the unfortunate assassin, Joshua, would get a taste of the boot. During the painful torture William stared into Maldrake's hard cold eyes. "I'm going to escape . . ."
"Go ahead," replied Maldrake, quite unconvinced. "And, I'm going to kill you!" declared Navarre grimly. "To the underground cell with him." The guards hurried off with him and thrust him into what he considered a damp cave with only one window high above. Moreover, to insure no possible means of escape they locked him onto a heavy chain driven into solid rock. It appeared a manner of escape was unconceivable, let alone possible to enact! When William awoke the jailer had already come and left him his poor share of food and water. It didn't take long for him to realize that the jailer had no schedule for when he came and sometimes he even came twice in one hour so an attempt at escape would be discouraged since the jailer could likely come at any time. To escape he would need first to break the chain that bound him so the next evening, as he presumed it was, he set to work an hour, he guessed, after the jailer had left. First Navarre tried to break the shackles using a huge boulder but it made so large an amount of noise that the guard came rushing in, "What in the world are you doing?!" "Uh, me?" "Who do you think I'm talking to? The wall?" he yelled aiming a slash at Navarre which he deftly avoided. "Oh, nothing happened except an underground avalanche." "Nothing but an underground avalanche, eh? Well, that's very unlikely but as you can't escape I'll leave you to yourself!" With that he slammed the door. Than Navarre quietly set to work at breaking the chain again, this time using a bone to pop a link of the chain. After a while when it was still not separating he took a drink of the musty water. He aimed a kick at a rat sending it darting away. Then he tried again. SNAP! Suddenly the link went flying and struck Navarre's left leg with the force of a thunderbolt. He suppressed a cry of pain, but suppressing the throbbing was the thought that at last he was free! …somewhat. Next step was to find out how to get out. As Navarre looked around his gaze invariable pointed upward… a sliver of what he thought to be moonlight glimmered in through a small window high above. An idea struck Navarre, if that window led to the outer wall of the castle… slowly and with much difficulty he began to ascend. After a tediously long time climbing, which he thought must have been about an hour, made all the more difficult by his hurt leg and his cumbersome chain of which a part he still had fastened on, he heard a creaking below and to his dismay the door opened and his jailer walked in! Navarre remained perfectly still while the astonished jailer looked all over making sure that he wasn't concealed, although, except were William really was, there was no hiding place in the damp cell. As the jailer turned his gaze upward Navarre closed his eyes waiting for the yell that would mean his recapture. Unexpectedly, however, he heard the jailer retracing his steps and close the door. The jailer was going! Had the guard seen him? No he thought not, but he had certainly discovered Navarre's absence, that is, what the jailer must have thought to have been his absence, and undoubtedly, he had alerted the rest of the guards. Even as he began to climb higher he heard the bell which would indeed make his escape even more perilous. When he reached the window, which he did in surprisingly few minutes, he heard the guard coming to recheck but he was through the window before they entered. As he began to peer out the window he expected to see the moon glittering on the water… the moon however was nowhere, all was black except farther above there was… a grate full of resplendent moonlight! He was shocked and disappointed! Footsteps sounded above and Navarre heard the angry voice of Maldrake. As William pondered what to do next it occurred to him that he was in the underground water resort, called the reservoirs that every castle had. He realized that his only chance was to jump into what he thought was water below him. His chance of survival was undeniably slim though with a hurt, perhaps broken though he thought not, leg, as well as a burdensome chain and no idea, supposing always that he was correct in his assumption that beneath was the water in the reservoirs, how far it would be to the end of the underground lake if he could get out at all and how far he was from whatever was below him and on top of all that the guards thoroughly alert and looking for him. All this he summed up in a minute and, despite all the hypothetical situations necessary for him to live and escape, without second thought took the leap. He landed in the water and stung his left leg. As he began to swim in no particular direction he realized his left leg was no good for swimming but he managed to swim around for some time. After some while he felt his power draining. However just at the moment he started to sink he touched the rock bottom which infused in him enough energy to make it to the entrance! On rising to find out if the way out was locked however, he felt powerless. Seeing this he fell into a deep sleep and on awakening went to the entrance where sunlight dazzled his eyes which had gotten accustomed to the darkness. He found that it was unlocked! After he made his way out and to a dark corner he used what he found lying around to rid himself of the chain still secured to him. As William Navarre walked down the passage way leading to the castle wall, he heard the unmistakable voice of Galainir say, "… made it clear, what do you say to my plans?" 'Wonderful!' thought the revengeful Navarre, 'Perhaps the time to strike has come.' But, to his disappointed, the others with her had weapons, so he thought it advisable not to try anything, though incautiously he thought eavesdropping not at all to dangerous. "Well I have several points," replied Maldrake's voice, "the first is that too many of our 'protecting' prisoners have been escaping and that the invasion throughout Roawia might be severely repulsed suppose we lost the majority of the captives. Especially important, 'Good' queen,” at this the other two laughed, Galainir with that evil laugh, “are the three leaders, so I'd strongly advise we let them live and not kill them..." "About that mission into the territory the Outlaws claim," the other adviser picked up where Maldrake had left off (really just plain interrupting), "I think that they are about the only ones who might prove to be loyal to you and if you just go invading into what they think of as their own the few willing to be in league with us would decide that they would not want to..." "Who cares about them when all of Roawia is under my power? Moreover, with a few outlaws captive, anyone knows that they wouldn't all be absent from such a great opportunity, we have them in our power! Ha, ha, ha!" Footsteps sounded in the hallway and Navarre beat a hasty retreat more intent on what he had overheard that whether any one was around the corner. Soon he was climbing the steps to the top of the castle wall. As he turned a corner leading into the open air he bumped right into a guard! This brought him out of his reverie and he sprung on the shocked guard who yelled to his comrades who came from all directions but appeared to have no inclination to stop the fight and crowded around on all sides except were the battlements were. After William overthrew the guard, however, they were upon him and he backed near to the battlements. He looked down... the scene which presented itself to view could terrify anyone; it was a sheer drop of almost fifty feet. This, or capture, was Navarre's only option. He again looked up at the guards. He glanced down, and then up, then, astonishing the guards he threw himself over… Falling falling… Splash! When he hit the water he felt like an eternity had past, not just three seconds. He was surprised an arrow had not made its way through him! Nevertheless he swam with will, encouraged be the fact that his leg no longer hurt, and for a whole dreary day he swam and floated on his back at intervals. Then he began to feel exhausted, but in the moonlight he saw something glimmer, it was a rooftop! Soon firm ground was beneath his feet. He was free! He began his trip back to Aldermore tower in the swamplands down south without delay as he recalled what he had overheard. We now return to the fortune of Gavin of Lockwood and Joshua Navarre. Fortunately for them they were locked in a "decent" cell together. Still the food they received was horrible and neither had any desire to stay there more than they had to. "Any ideas? I'm open to suggestions!" Joshua asked Gavin one day, about a week after their imprisonment. "How about this;" responded Gavin, "we get that boulder and toss it at the door, then we sabotage the guard and get out of here. Then, we go to the harbor, find a ship, hide in it, and away for the mountains and swamplands!" "It sounds easy…" shrugged Joshua, "but…well… what are you waiting for?!" But moving a boulder IS easier said than done and throwing one even harder! It took all of their strength to lift it and then they barely managed to get it a few inches away from where it was originally. Gavin sighed, "If at first you don't succeed, try again!" He wasn't willing to give up the idea so they tried again. With worse results! This time it landed on Gavin's foot! Gavin yelled and Joshua flung himself on the mat. However to their extreme surprise and delight the boulder rolled to the door which fell nearly on top of an astonished guard! Joshua leaped from the cot and jumped on him. He fell and dropped his battleaxe without a sound, it was done so quickly. Gavin and Joshua proceeded to the next guard in the hallway up the stairs. Gavin had got the axe but just as they got up the stairs the guard turned. The sentinel and Gavin jumped at each other and both the battleaxes went flying providing a weapon for Joshua who was about to attack the guard. Just as Joshua swung with the axe Gavin pushed the guard into the wall and he missed hitting the guard and instead whacked the wall! Soon the guard was killed and the duo made their way to the wharf. At the dock there was a continual coming and going of the queen's men in ships. So, it wasn't hard for Gavin of Lockwood and Joshua Navarre to climb aboard unnoticed and they found a somewhat safe place to hide in the mast top… Hours later… The captain of the ship told someone to go up and see how far it was to land as they were far out sailing through the Sea of Despair. The ship was overflowing with the queen's soldiers and bound for the swampland but despite the fact that this is where Joshua Navarre and Gavin wanted to go they were far from joyful. "What now?" asked Joshua as though proving the fact that Gavin really had no plan. "Easy! We throw him off when he gets up!" "Do you know what to do afterward?" retorted Joshua, "We can't just stay here because by then they'll know we're up here!" "Why! We’ll jump off; we can swim the rest of the way!" "Why not, we're only a ways away from land." So they were prepared when the soldier climbed up to where they were and when the man was up, before he could recover from his shock, Joshua knocked out the axe from his hand and they locked together in a scary fight! As they wrestled Joshua, freeing himself from the strong grasp of his combatant, swung around the mast and kicked the man overboard! Then both he and Gavin dived together off the mast! Now we turn to yet another point of view; Areneas's. It was not till at least some days after the coronation that he learned what had happened, as, though Joshua had known about it very soon, he had told no one in the castle. He also had ruined plans, actually as a consequence of the ruined plans of William and Joshua. As he paced back and forth he realized that most Outlaws would not be in favor of the queen, especially those captured, including William Navarre. He also figured that Joshua had gone to do something about his brother's capture and behind all this he knew the plan of Navarre's which he had overheard was only to be blackened further, though it had been disturbed. He decided to pay attention to the doings of the Outlaws; the queen needed spies and he could, doubtless, use any information to his own advantage. From thence he was but a shadow lurking in the darkness! On a bitterly cold morning while the wind hisses around the snowy mountaintops we find three lone travelers nearing the end of a most dangerous ascent to the peak of the mount of Ort Necrosis, not surprisingly named after the nearby town or Outlaws lair. "Do you not think we should turn back Captain Keeler? I believe there must be an approaching storm, and it would not be well to be caught up here in one. Beside it is clear that the mountain goat we were pursuing has escaped and night is drawing nigh." "Let us reach the top first; it would not be well to return to Navarre empty handed." When the tired men reached the top a fierce blast almost blew them off their feet. As a few drop of snow landed at their feet the Captain Keeler yelled above the wind, “Enough! Let us turn back. And hurry, time is running out!" As they turned to begin the dangerous descent a crash, easily heard above the storm, rent the air. They turned and to their horror beheld a giant serpent rising out of the ice filled crater! Keeler's sword flashed out in an instant and then one of the men, losing his footing, tumbled down the cliff. As the creature brought down its tail, Keeler waved his sword and ducked in time to avoid being crushed, then, uttering a war hoop, he slid down the slope followed closely be his friend. Thankfully, however, the serpent slithered back to its den, content to have successfully scared away the men. Lord George was in a BAD mood. His joker could tell this and went to cheer him up. "Wish to play a game of chess?" He asked. "NO!" was all he got as an answer. Lord George, however, quickly changed his mind since he decided that he needed things to be enlivened. He had ended up having to climb up on the rubbish his destroyed invention had created. Now he was playing chess with his joker. Unfortunately, both he and the joker were playing absentmindedly, and before they realized it Lord George was in a horrid checkmate! He was furious and the joker ran for it towards the doorway with a few chessmen flying at him from behind! However, he made it out leaving Lord George in a worse mood than before. Navarre, like almost all Roawians, was busy preparing for war. He had recently brought some disguises and his men were trying them out. However, William Navarre still wanted to get revenge on John of Guarmal and therefore challenged him to a dual. 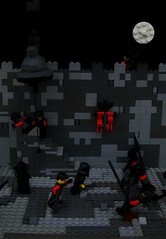 He figured that as he had had little fighting recently he could improve his skill at the same time as he took revenge. John accepted the challenge not knowing who he had been challenged by. A day later he arrived with some men and they assembled in the courtyard. When he saw Navarre he yelled, “Traitor! Arrest him; he is a pirate in disguise!” However William declared, “My good friend you know times are different now and a Noble is of no higher rank than an Outlaw! Besides you agreed to a dual between you and me with no interference. So turn your anger into energy. Ha!” They both charged at each other, the onlooker breathlessly awaiting the outcome. Clash! Clang! Steadily, Navarre retreated as John ferociously pushed forward. Everyone wondered why he was doing this since he could obviously hold his own. But Navarre knew what he was doing and as his opponent swung his sword at him again he dodge and ran with his back turned to his enemy. John wildly ran forward completely off guard and suddenly, as he was about to be overtaken, Navarre turned and swung his sword heavily at John. John deflected and slowed the blow with his shield but it came across William’s antagonist’s left eye throwing him backwards. As this happened Guarmals men rushed forward stopping Navarre from killing him and a melee issued. Nevertheless, Guarmals men quickly retreated taking him with them. Areneas was thinking one day soon after the dual when Navarre entered the room. He had just been considering staying with Navarre rather than betraying him for quite a few convincing reasons. One, because he feared Navarre’s revenge, also because he liked Navarre, and also the Queen seemed a breaking read to lean on. Anyway he was decidedly for Navarre after what he said: “By the way, I still what more weapons so I will send you and Keeler on a mission, if succeed well I will promote all involved to a higher rank.” Areneas uttered a satisfactory grunt. “I will now tell you the plan.” Sometime later they were on their way to one of the queens nearby weaponries. Navarre had already transferred almost all his men to his fortress on the Loresii border near The Shade a while ago. Areneas was in disguise as an outlaw noble in favor of the queen and was in the lead, someway behind crept Keeler and his men dragging empty bales and crates. When they reached the armory Areaneas went forward leaving the others hidden. He marched up and the two guards let him in after inquiring who he was, however he left the gate ajar after he entered. Then he asked for a glass of wine and said he could give them information about the position of the outlaws planning to attack if they took him to the ramparts which they did. Then he started feeding these tons of lies. Meanwhile Keeler and his men crept in and, loading the bales and crates with weapons, crept away. At the same time, Areneas was having a lot of fun contributing all the false information to the queen’s men. Areneas now got to the supposed point, “By the way the real reason I came was for weapons for my men so…” “Did you hear that?” one of the men said as there was a clatter. They all raced to the place where the weapons were stored. “There all gone!” exclaimed one of the guards, “oh! We are in trouble if we can’t find them!” “Rats!” Bellowed Areneas, “Where?” asked a guard. “No silly, I mean nasty.” Areaneas was getting a kick out of the thing, “I wanted some weapons.” “Oh, well let’s hurry so we can catch them, they can’t have that much of a head start!” And off they went in the direction of the fake castles Areneas had pointed out, leaving the chuckling Areneas to make his way to Navarre’s fortress at his leisure. “I order you to surrender on the bases of my promising to treat you fairly and as a prisoner of war! Surrender!” Navarre had been forced away from his friends by John de Guarmal and now was being summand to surrender to john of Guarmal. “I surrender,” replied Navarre. Guarmals men rapidly took him and, robbing him of his weapons, tied him securely. It was extremely uncomfortable and absolutely impossible to walk, therefore he was placed on a horse and his feet tied under him. They then traveled toward the coast of the Great Southern Sea, taking advantage of every forest to hide any tracks. Meanwhile, Navarre’s men hurried back to Raltworth castle and General Keeler, after gathering some men, headed for the Great Southern Sea, while Areneas headed east for the Sea of Despair, leaving Ralincler to guard the castle against any sudden attack. They planned to rapidly sail to Garheim and, if they didn’t find traces of Guarmal, to cross Garheim and finding each other, join and track him down. We will follow the adventures of Keeler. After ten days march they reached the coast and renting a small but fast black and red boat set sail after their captain. They were dressed in the armor they had taken from the queen’s armory as it would draw less attention from the queen and in addition, Navarre had before his capture hinted that he might join the queen if thing went her way. A little ways below on the coast two days ago the party of Garheims had joined another group on board a large ship with a strange thing onboard that looked like a ladder staying up only because of a chain to Navarre. John called this thing a corvus and apparently it was supposed to be used by dropping it on anything they wanted to board. Navarre was untied and transferred to a much more comfortable cage which was guarded only by one man. On the side there was a key hanging but Navarre knew that it was for something other than the cage because, despite the fact the he had been blinded before they put him in, he had heard no keys or grating. Three days later they stopped at Crakenhaven which lies on the island of Norhom. At the same time Keeler and his men were rapidly catching up with them by traveling night and day and were just passing Isil Oro. Seven hours later brought them to Crakenhaven but Guarmal and his men had already left and Keeler, seeing that his men were exhausted stop for a couple hours and then pressed on as hotly as before. Soon they were within sight of some sails and doubting not that it was Guarmals ship passed it and continued on till they were at the narrowest point of the Merkorion channel and there lay in wait for Guarmal. John de Guarmal was in a good mood, he had no fear of persuit and still less of an ambush. In addition they were traveling at a good speed considering that there was no wind. Abruptly a man called out in a loud voice “Surrender, or your dead men!” Looking at the cliff jutting out on the right from whence the sound had issued forth Guarmal beheld a man on horseback alone, who appeared to be a noble from the queen. “I shall not surrender! Lower the corvus!” This was unexpected by the man and he appeared vastly startled, however as they were about to cut the chain one of the men screamed and round the cliff came a small cutter full of men all dressed as the queens men and armed to the teeth! Immediately Guarmal yelled and cut the chain using great force. Leaping up from behind the rocks Navarres men charged down the corvus at the astonished Garheims who were grabbing up any weapon to defend themselves. As the men from the cutter were jumping on board Guarmal shouted “I surrender!” laying down his armor which he had taken off. But before the Outlaws could react he had jumped over the side! Furious at his having escaped Navarre men lead by himself, for he had leapt out of the cage as soon as the attack had begun, killed all of the men but the few that escaped. For pictures up to this point go here. We will pass shortly over the travel through Roawia but just state that although Navarre’s men continued to wear the queens armor they innocently kept up a continual harassment of the dragon knight, hanging the up in trees and trapping them in pits. Soon they arrived at Raltworth Castle and gathering his men Navarre set out to take part in the siege of the Queen Galainir’s castle! As Navarre and his men marched towards the Royal Castle Navarre thought of the war. His own men amounted only to 2000, but he had hired some wild men from the shade and was to join up with some allies from all three of the provinces at the Queen’s castle. In total, he considered their combined forces should be over 6000, but supplies for a long siege and siege engines was what he had to worry about. He only had enough horses to carry about six engines and had high hopes that the allies could provide twelve more; at least…Ten Days Later…William Navarre had been disappointed by his allies who only had two siege engines and limited supplies for a siege. However they managed after 15 days to affect a breach in the wall and now planned for the attack! Looking over the hillside toward the castle Navarre surveyed the prospects. What would the coming battle hold? Little did he imagine as he gazed over the walls the desperate position he would be in by the following evening!...Tramp, tramp, tramp, as the men advanced toward the breach in the wall arrows poured down upon them in heaps. The assault on the breach was one of the two attacks to be made on the castle the other, which was to be made on the wall with ladders, was led by Navarre’s second in command and only a few men. In fact that was just to be a diversion; the serious attack was on the breach and led by Navarre himself. Navarre knew if that his allies planned to infiltrate by cutting the chains of the drawbridge and rushing hopefully unseen in the confusion into the castle. Under the storm of arrows the two forces laid the make shift bridge and placed the ladders across the moat. Rushing forward under boiling oil and a barrage of arrows with Navarre at their head the troops bravely forced the breach covered by the spiked catapult outside the walls. However they were met with the prince Zerxes and his men and slowly were being forced back when their allies rushed over the now lowered drawbridge and charged the flank of the prince’s men. Again they were on the verge of taking the castle when Calvary reinforced their opponents and charges scattered Navarre’s forces and pursued the hotly till the water’s edge where they scattered and ran. Back at the castle forgotten and forsaken lay Navarre, wounded and bleeding could this be the end? I'm just going to update the story here. Last edited by josdu on Wed Apr 30, 2014 9:00 pm, edited 2 times in total. Re: William Navarre's Story. LCC MOCS. See The Coronation for what happened between this and the previous part of William Navarre's story's. Joshua Navarre was shocked at the turn of events. William had gone to the banquet in disguise and gotten captured which disrupted their plans entirely. Well, Joshua was not going to let his brother be a captive but how was he supposed to help him out of a island fortress when in all likelihood he would not be able to even get to the island unseen? As he wandered through the swamp he thought about the ways Navarre could escape. At the other side of the swamp someone else was in meditation too and soon the two saw each other. "Why Gavin of Lockwood, what are you doing? Have you heard the news?" asked Joshua. "Oh yes astonishing news! Who would have thought that the queen was evil?" Gavin replied, "but perhaps you can give me more information?" "Yes, everyone attending the banquet is a prisoner and action against the new queen will result in their torture!" "Even the three leaders?" "Yes, and Navarre as well, so perhaps we could devise a plan to help him escape?" "Where are they prisoners?" "Ah! That is a difficulty!" answered Joshua, "they are kept in the castle on the kings isle which nearly impregnable against attack and I think escape will prove to be very difficult!" They talked on for some time until they reached the edge of the swamp where they separated planning to gather information and think of ways to help Navarre escape and then meet nearer to the kings isle. Prelude to the GCV. BTW sorry about the double post . If you want to make use of the first post you could just move the story up and continue with the second one. Thanks! Yes I had thought of that but will an edit be noticeable on the forum? Once Joshua Navarre reunited with Gavin he had hit upon a plan. On a dark night they went out silently in a boat and once near the kings isle slid into the water leaving a companion to bring the boat to the isle in three nights. Swimming underwater a ways they found the sewer system and swam into the castle. When they reached a grate they lifted it and climbed out into the courtyard. Then they hid until a guard came by and Joshua disposed of him placing the guard in a convenient spot where no one would notice. Then they set about trying to find where William Navarre was kept. The story's pretty good. But some more description wouldn't hurt. Nice vignette. If you have anymore trans-blue/clear pieces it would make it look even better. Yes, I agree with the suggestions offered by Aeridian. Those trans plates work wonders for water! Nice! It would be cool if you could make the water more interesting, maybe adding whitewater behind and to the side of the boat, and even making the boat more interesting. William Navarre, due to the fact that some rascally Loresii convinced him to take a drink of wine (that stuff is addictive), soon got too drunk to fight back the queen's men or to remember all his hidden weapons. By the time he was again sober the queen's men had taken any weapons he had brought and he was in a dungeon all by himself, which had only one small window high above. Next day in the morning he received a chunk of black moldy bread and some water from the jailer. Thoughts swirled in his head, but each idea of how to escape was more impossible than the other. He threw himself on the cot. If only he hadn't come! Then he began to blame those Loresii that had him take some wine but at second thought he decided he didn't want to be the next Roawian martyr. He soon fell asleep thinking of a feasible way to escape. After he had been asleep for some time he suddenly awoke. What had awakened him? The only noise was the scurry of mice. Then muffled thuds came from outside. He got up and went near the door, which someone open. "Joshua!" "Wait," Joshua replied, "come with me." They ran silently down the passageway followed by Gavin. "What is your plan?" inquired Navarre of his brother. "There is a boat waiting outside the gate, but hush! Now comes the most dangerous part." "What's that?" "Passing the guard in charge of the alarm bell!" Joshua walked silently into the court, the guard saw him and reached for the bell just as Gavin's knife flew at him reaching him before he could ring the bell. Suddenly the jailer burst into the court having discovered Navarre's absence and he raced up the stairs narrowly missing another of Gavin's daggers. Bong, bang, bong! The guards came rushing into the court and though they fought bravely soon Navarre, his brother, and Gavin of Lockwood were locked in the dungeon. Very nice story! The pictures are very small though, and hard to see detail. Oh no! Their escape was foiled... what will happen next? One thing I noticed though, it's kinda confusing who's talking. Maybe when you have someone talk, have the next persons dialogue on the line below, instead of right after on the same line... I hope that made sense. Your builds are improving, so keep at it, and with some better writing you'll do great! Thanks all! Well just go to my Flickr or click the picture and you can see them larger moph . Yea the talking is confusing, I'll try to fix that! I won't do this again (I'll not answer your comments if you put any here until I've got a story) , but can someone post something more please? Torture, a dreadful word. The wheel, the boot, the drop, all torture is horrible and painful. Yet sometimes one can undergo it and at other times one must. William Navarre and his brother were to soon come acquainted with torture. However, despite wishing very much to discourage them from escape, Maldrake, the new queen's adviser, did not wish to kill them, therefore the wheel or gibbet would not be their fare. Instead, William, as well as Gavin of Lockwood ,would have to undergo the drop while the unfortunate assassin, Joshua, would get a taste of the boot. During the painful torture William stared into Maldrake's hard cold eyes. When William awoke the jailer had already come and left him his poor share of food and water. It didn't take long for him to realize that the jailer had no schedule for when he came and sometimes he even came twice in one hour so an attempt at escape would be discouraged since the jailer could likely come at any time. To escape he would need first to break the chain that bound him so the next evening, as he presumed it was, he set to work an hour, he guessed, after the jailer had left. First Navarre tried to break the shackles using a huge boulder but it made so large an amount of noise that the guard came rushing in, "What in the world are you doing?!" "Uh, me?" "Who do you think I'm talking to? The wall?" he yelled aiming a slash at Navarre which he deftly avoided. "Oh, nothing happened except an underground avalanche." "Nothing but an underground avalanche, eh? Well, that's very unlikely but as you can't escape I'll leave you to yourself!" With that he slammed the door. Than Navarre quietly set to work at breaking the chain again, this time using a bone to pop a link of the chain. After a while when it was still not separating he took a drink of the musty water. He aimed a kick at a rat sending it darting away. Then he tried again. SNAP! Suddenly the link went flying and struck Navarre's left leg with the force of a thunderbolt. He suppressed a cry of pain, but suppressing the throbbing was the thought that at last he was free!…somewhat. Next step was to find out how to get out. As Navarre looked around his gaze invariable pointed upward… a sliver of what he thought to be moonlight glimmered in through a small window high above. An idea struck Navarre, if that window led to the outer wall of the castle… slowly and with much difficulty he began to ascend. After a tediously long time climbing, which he thought must have been about an hour, made all the more difficult by his hurt leg and his cumbersome chain of which a part he still had fastened on, he heard a creaking below and to his dismay the door opened and his jailer walked in! Navarre remained perfectly still while the astonished jailer looked all over making sure that he wasn't concealed, although, except were William really was, there was no hiding place in the damp cell. As the jailer turned his gaze upward Navarre closed his eyes waiting for the yell that would mean his recapture. Unexpectedly, however, he heard the jailer retracing his steps and close the door. The jailer was going! Had the guard seen him? No he thought not, but he had certainly discovered Navarre's absence, that is, what the jailer must have thought to have been his absence, and undoubtedly, he had alerted the rest of the guards. Even as he began to climb higher he heard the bell which would indeed make his escape even more perilous. When he reached the window, which he did in surprisingly few minutes, he heard the guard coming to recheck but he was through the window before they entered. As he began to peer out the window he expected to see the moon glittering on the lake… the moon however was nowhere, all was black except farther above there was.. a grate full of resplendent moonlight! He was shocked and disappointed! Footsteps sounded above and Navarre heard the angry voice of Maldrake. As William pondered what to do next it occurred to him that he was in the underground water resort, called the reservoirs, that every castle had. He realized that his only chance was to jump into what he thought was water below him. His chance of survival was undeniably slim though with a hurt, perhaps broken though he thought not, leg, as well as a burdensome chain and no idea, supposing always that he was correct in his assumption that beneath was the water in the reservoirs, how far it would be to the end of the underground lake if he could get out at all and how far he was from whatever was below him and on top of all that the guards thoroughly alert and looking for him. All this he summed up in a minute and, despite all the hypothetical situations necessary for him to live and escape, without second thought took the leap. He landed in the water and stung his left leg. As he began to swim in no particular direction he realized his left leg was no good for swimming but he managed to swim around for some time. After some while he felt his power draining. However just at the moment he started to sink he touched the rock bottom which infused in him enough energy to make it to the entrance! On rising to find out if the way out was locked however, he felt powerless. Seeing this he fell into a deep sleep and on awakening went to the entrance where sunlight dazzled his eyes which had gotten accustomed to the darkness. He found that it was unlocked! After he made his way out and to a dark corner he used what he found lying around to rid himself of the chain still secured to him. Falling falling… Splash! When he hit the water he felt like an eternity had past, not just seventy seconds. He was surprised an arrow had not made its way through him! Nevertheless he swam with will, encouraged be the fact that his leg no longer hurt, and for a whole dreary day he swam and floated on his back at intervals. Then he began to feel exhausted, but in the moonlight he saw something glimmer, it was a rooftop! Soon firm ground was beneath his feet. He was free! He began his trip back to Aldermore tower in the swamp lands down south without delay as he recalled what he had overheard. He must be an extremely slow faller if it took him 70 seconds to drop 50 feet! Nice story! A agree with AK though, that is hilarious that it took him 70 SECONDS to drop only 50 feet.